They came for a season and stayed forever. There’s something about Jasper and Marmot Basin that casts a spell. Erin Reade arrived in Jasper as just another Australian on a one-year Working Holiday Visa. Four years later Marmot Basin’s marketing manager is working to become a Canadian citizen. Along the way she’s learned to cross-country and backcountry ski, rock and ice climb, mountain bike and compete in triathlons. Her Canadian family is her friends, who range from born-and-bred Jasperites to other newbies from across Canada and beyond. For Reade, Jasper is home. There are two reasons she’s fallen for the town and sprawling national park four hours west of Edmonton on the Alberta side of the Rocky Mountains. The first is obvious, the playground that is Jasper. That’s the name of the town and mountainous national park that surrounds it. Here the Icefields Parkway cuts deep into the towering range, accessing some of the biggest glaciers and mountains in southern Canada. The area is famous for its consistent and quality ice climbing. Trails near Jasper are ideal for fat tire biking. Wildlife is plentiful—not seeing an elk in Jasper is rare. Then there’s Marmot Basin, an overlooked gem of a ski area. One of the highest resorts in Canada, it brags consistent snow, long winters and wide-open slopes. Visiting Jasper and Marmot in the middle of last winter, photographer Chris Baikie and I didn’t wait in a line once, inside or out, even on a sunny Saturday. We hiked to fresh powder, skied soft bumps and raced down long, rolling groomers. At prime-time lunch stops service was fast and tables were plentiful. Two days after we left, it snowed more than half a metre of Rocky-style dust. Reade was kind enough to send us picture-proof of fresh tracks well after lunch. That can be rare in a resort town, but especially one with a large transient population of short-term workers like Jasper. Maybe it’s something in the glacier-fed water or the crisp mountain air. It could be that no one ends up in Jasper by accident; it’s not the easiest place to get to and is heavily overshadowed by Banff, it’s southern neighbour. Whatever it is, the place is special. So what does that community mean to a skier visiting Jasper and Marmot? It’s a feeling that’s hard to explain but pervades the resort and town. It’s kind of like arriving on a tropical island in the middle of Switzerland. Stress, seriousness and stiffness are non-existent, and everything is efficient and easy. To understand it better we tracked down a few of the locals who help to define this unique ski destination. Not surprisingly, the day Marmot Basin opened in 1964, GEORGE ANDREW was there—his dad owned a hotel in town. That first lift-assisted run hooked the 12-year-old for life. Andrew eventually took over the iconic Astoria Hotel from his dad and has been skiing Marmot ever since. 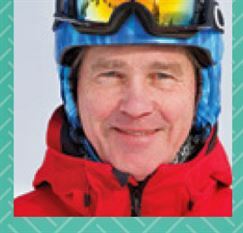 Despite his job in town, he still teaches skiing for the resort and guides his guests staying at the Astoria. And back in 1980, Andrew was one of the original Ski Canada On-Slope Testers. Hang out with Andrew long enough and it’s obvious he has things figured out. 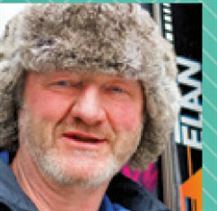 He runs a successful business, skis almost every day and is always quick to laugh. He credits Jasper for his easygoing attitude. 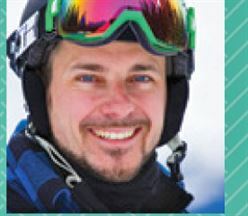 NIC BAZIN was head coach of the Whistler Blackcomb Freestyle Ski Club when the job of coaching the Jasper Freeride Club, a competitive mogul team, came up. A similar job was on the table in Fernie. For the transplanted Quebecer, the move to Jasper was an easy choice. The high-level coach and former competitor has had an impact. Since he arrived in 2011, the Jasper club has improved to become one of the top teams in the country and the top in Alberta. CHARLIE FINLEY remains the quirky old-time local everyone knows. And he’s easy to spot. He’s the guy driving the old Volvo station wagon with the DIY roof rack made of hockey sticks and bike inner tubes passing you on a corner. He’s also the guy lapping you in a vintage ski outfit and 200-cm straight skis. Don’t let the white ponytail and scraggly beard intimidate you: he’s one of the friendliest people in town. The former railway engineer is old school to the core. Many of the 42 straight skis in his collection come with a story or famous previous owner in their history. He’s skied on most of them, and has never tried a pair of shaped skis. He’s a knowledgeable wine lover who flits from scene to scene at Jasper’s many bars and restaurants, often with a choice bottle or a flask of whiskey hidden in a crafty walking stick or a cell phone. Sharp, witty and chatty, he’s as local a character as they come. “I love this town and the ski hill,” he said. “The people here are fantastic.” And even though it’s not actually named after him: “Nothing’s better than Charlie’s Bowl on a powder day.” Amen to that. Want an ex-Olympic and national team ski racer to serve you dinner? Head to the Fiddle River Restaurant on Jasper’s main drag. One of the servers is LONI KLETTL. 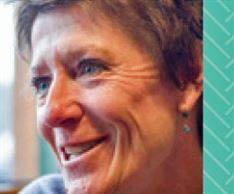 She raced alongside the Crazy Canucks in the late 1970s and early ’80s, including at the 1980 Winter Olympics in Lake Placid. 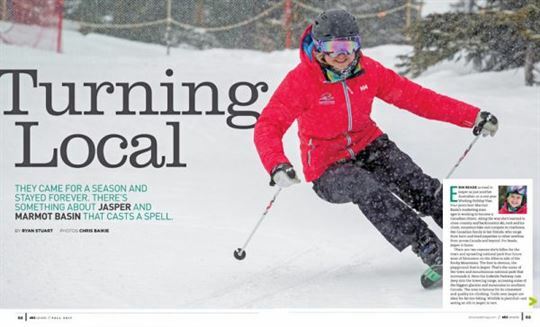 A bundle of energy, Klettl gets out on the trails and the slopes every day, and often both in the same day, before she starts the evening shift at the Fiddle River. She spends an equal amount of time in the backcountry as she does at the resort, and never tires of either.